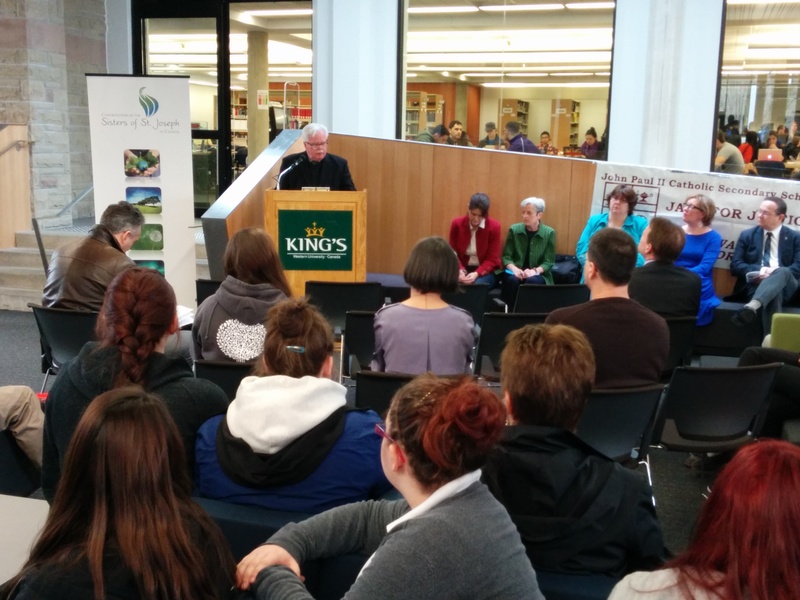 Task force member Ross Fair announces new London Poverty Research Centre from King's University College. It’s about finding a new way to address poverty in London. On Tuesday, officials from a number of community organizations came together to announce a new think-tank venture to change the way Londoners think about poverty. The initiative is bringing together partners Kings University College, the London Food Bank, Emerging Leaders and the Sisters of St. Joseph in an effort to find a solution to London’s poverty problem. While there is no physical centre, those involved in the project are meeting on a regular basis to set a road ahead for discussion on poverty in London. London Food Bank co-director Glen Pearson says the point is to start listening to the stories of people living in poverty and then identifying real ways to help solve their problems. He says he likes to think of it as “living research”. Pearson says donating food is no longer enough, the public has to get involved to help solve the root of London’s poverty problem. Ross Fair, a member of the Poverty Research Centre Task Force (and the City of London’s former lead in the fight against poverty), says the idea is to share stories that will change the way Londoners think about neighbours who are struggling. The Centre’s focus will be on precarious employment, food security, and mental health and homelessness. The London Poverty Research Centre has a new website, and Fair says the hope is to one day have a permanent office, possibly housed at King’s University College. King’s has committed to sharing research already being done on poverty in its Social Work, Social Justice & Peace Studies, Economics and Sociology faculties. The joint venture is being funded, in part, by one of the London Community Foundation’s biggest grants ever, totalling $250,355. The Centre partners will also offer some funding, or donations in kind.